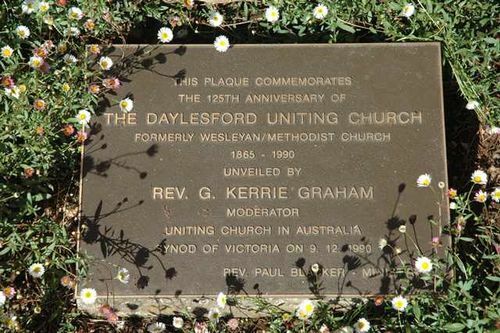 A plaque commemorates the 125th anniversary of the foundation of the Daylesford Uniting Church. It was formerly the Wesleyan / Methodist Church. The church service and the unveiling of the plaque were conducted by the Moderator of the Uniting Church in Victoria, Rev. G. Kerrie Graham and the resident Uniting Church minister, Rev. Paul C. Blacker. Information supplied by Daylesford Uniting Church.